Egg containing a chicken. But which came first? “Are you kidding me? Outta my way.” I haven’t leapt from a bed that fast since the house caught fire last year. 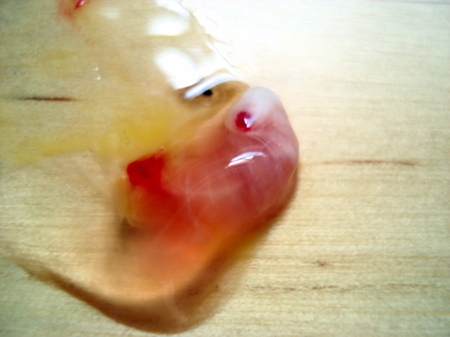 It was a tiny, jelly-bean sized chicken embryo. Heart, blood vessels, and eye were clearly visible. A quick browse of the interweb makes me think my little Foghorn Leghorn was about 3 days old. Now some people might have been grossed out by Chicken Little here, but not me. I scientifically removed it from its veiny yolk with a fork and plopped it onto the table, where we could gaze at it in wide-eyed, horrified joy. I dunno about you, but when I make a meaningful scientific discovery I always like to consult with colleagues, so I called the cat over to investigate. Like any true scientist, the cat collects his data methodically. In this case he used several of his senses to gather qualitative data about our little specimen. He looked at it intently. He sniffed it daintily. 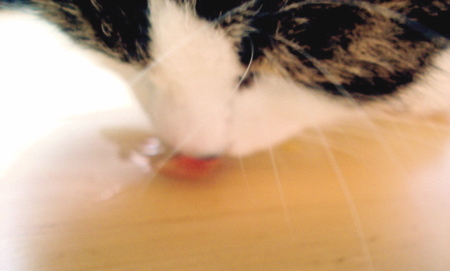 He licked it oh-so-gently. And then he swallowed it with a single toss of his fur-covered head, smacked his chops, and looked expectantly in the bowl in case there was another one. By the way, we scrambled the remainder of that egg with three of its siblings, then scattered on some shreds of sharp cheddar, coarsely-ground black pepper, and a few dashes of Tabasco. Science is delicious. This entry was posted on Monday, October 20th, 2008 at 9:35 pm and is filed under animals, cute, food & drink, i am not a crazy cat lady, ick, it's made of science!, medical, things i wrote. You can follow any responses to this entry through the RSS 2.0 feed. You can leave a response, or trackback from your own site. 18 Responses to Egg containing a chicken. But which came first? That is impressively gross! Hooray for science! Hear that noise outside right now? The voices raised in protest? That’s me picketing in front of your baby chicken slaughter house! I’m all for science but I question the hygenic state of your kitchen table/laboratory. Was the table clean when Cat ate the fetus? Could there have possibly been traces of chicken grease or chicken-like flavouring which would colour the outcome of the taste experiment? Did Cat follow up his/her experiment by tasting the feti of other poultry in order to compare tastes? 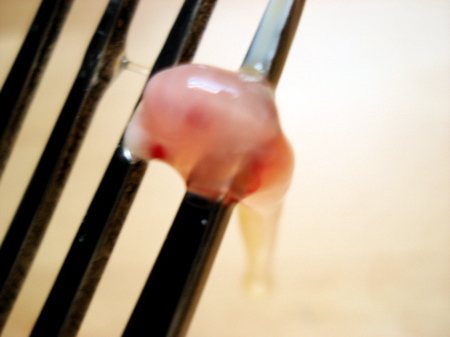 Perhaps this particular fetus actually tasted more like pigeon? Or vulture? We’ll never know. Science is all about proven fact. Without proper scientific procedure we might just as well abort scientific principle altogether. OMG that’s so gross I can’t stop looking at it! It’s like a train wreck, I can’t look away but it turns my stomach. These images are making me reconsider my egg eating policy. Totally cool! But…. I don’t think I could have eaten the egg afterwards. Do you have your own chickens and rooster? Or were they bought eggs? Storebought. From a regular city grocery store- I live deep in the city and I’d be surprised if there was a live chicken with 20 miles of my house. Although, actually, there are a lot of old Mediterranean people in my neighbourhood, and maybe one or two of them have a secret coop in the garage. Still, that egg should NOT have been fertilized! Glad to see that the reality of what eggs are is placed back in our conscience every once-in-a-while. Plus, there are people that believe that fertile eggs are healthier for you. Thanks for the recipe. 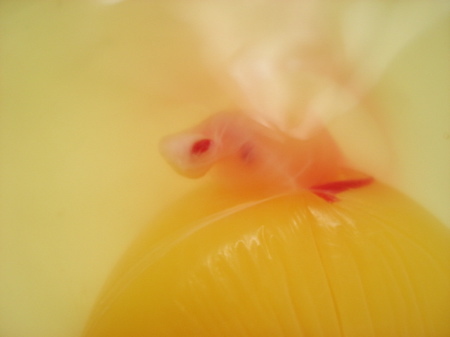 Oh, and farty, no animals look the way they do when they are born as they do in the womb (or in this case, egg…). They develop to look the way we expect them to over time, the same way a human baby does in the womb. cool photos. it’s a good thing i don’t get sick by looking at weird things. my brother came upon an embryo once, but it was a bit bigger. i remember when i was a kid i was looking at the eggs in my grandma’s chicken coop, and 4 eggs had holes in them, and my grandma said the chicks were coming out and told me not to touch them. but the chicks were coming out to slow, so i broke the shells for them and place them under their mum. lol. happy to report they lived healthily. ahhh, I am always scared of this happening to me when I cook eggs. I wonder if I would stop eating eggs… I’m pretty grossed out right now. Omg this is Horrible Why ???? I have 5 Chickens and even have my own pet one!! Chebika is as caring as a cat or dog!! I am disgusted at this :[!! I found one in an egg today, too. It really grossed me out, though, and ruined my cupcake-making mood. I still don’t know how this happened, because these eggs aren’t supposed to be fertilized. Must have been cross dressed roster in the coop! Ew seriously? You ate the egg afterwards?